Click the image to view the Rebecca Thomas recipe book in a page-turning viewer. Rebecca Thomas was a resident of early 19th-century Burlington, New Jersey. She recorded recipes, arithmetic lessons, and folk remedies in a small journal that brings to life the day-to-day concerns of early American women. The journal primarily consists of recipes and cooking instructions (e.g. “to preserve tomatoes for use” and “to make good cider”). 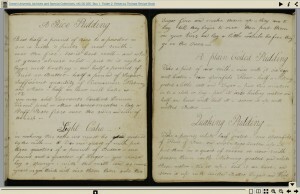 The recipe book is believed to have been owned by George W. Childs.